To get away from the rush of everyday life, we need a place where we can rest and recover. 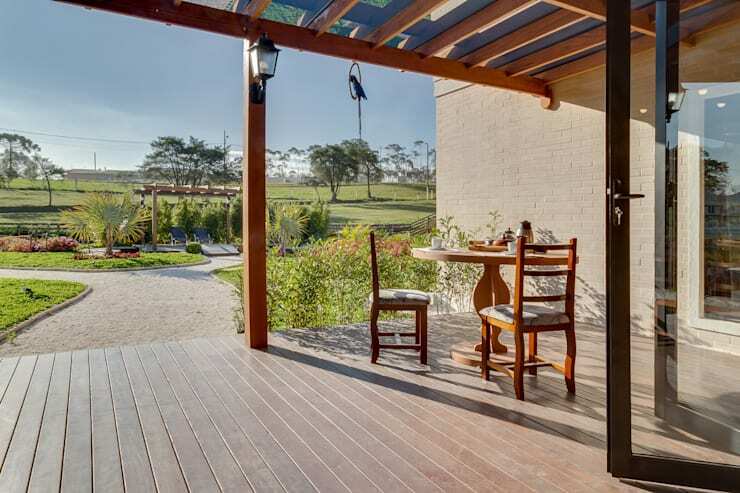 Built on a 5 hectare plot, this country-style home is an ode to outdoor living. 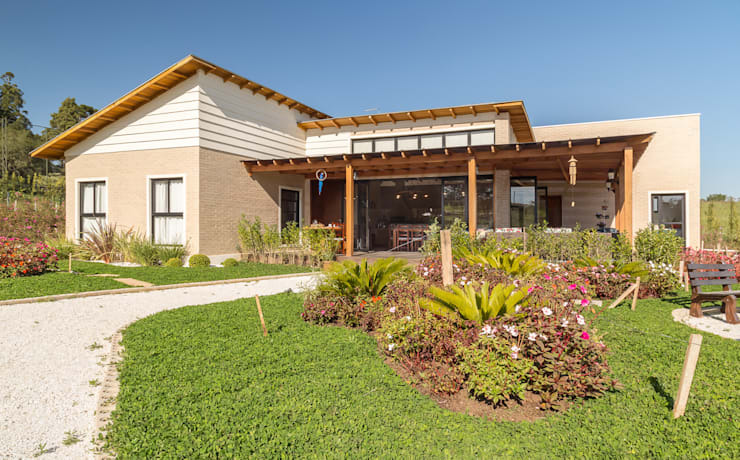 With wood used throughout the design, the beautiful rolling lawns and picturesque landscapes have been included in every factor of the architecture. 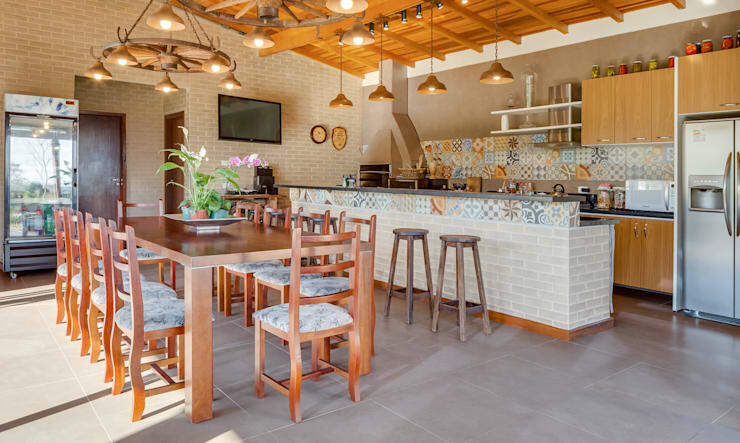 Design professionals Juliana Lahoz Architects, have really found a balance between rustic and modern. Once you explore this home, you'll realize just how important it is to create a home that is an oasis of relaxation and rejuvenation. From this image, we can see how modern the home is, yet the wooden features throughout creates a very warm, earthy and rustic look and feel. The home is large in size and resembles a restored farmhouse with its high roof and merging of interior and exterior spaces. Don't you love the wooden roof, which covers the terrace? The garden has also been carefully designed and arranged, with the beautiful plants, trees and flowers enhancing the exterior space. Remember that your garden plays a big role in the overall appearance of your home. 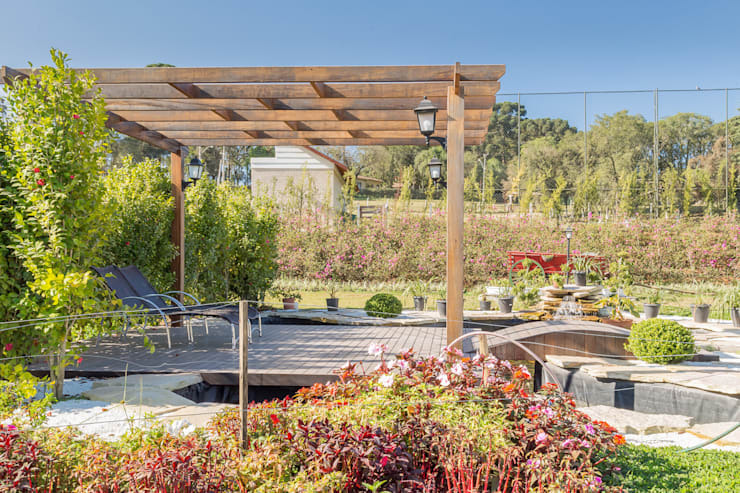 This wooden deck is the ultimate area for relaxing in the sunshine and fresh air. A wooden pergola finishes off the design beautifully! This terrace space is furnished with outdoor furniture including sun loungers and comfortable chairs. These durable pieces that will last in all weather conditions. This area also spills out onto a beautiful pond, filled with carp. A water feature like this always adds to the serenity of an environment, while enhancing the rustic look and feel. From this angle, we can see how large glass sliding doors allow for a wonderful transition between interior and exterior spaces. The inside living area flows out onto the covered terrace. This not only visually and physically expands the living spaces but it allows fresh air and sunshine to flow through the home. From this angle, we can see how much of a role wood plays in the design and decor of the home. It really adds to the warmth and charm of the environment. Can you see how wood contrasts beautifully with the brick wall, mixing materials? In this angle, we can see how all of the living spaces are connected, both outside and inside. There is also a beautiful connection to nature, where the designers have added pot plants and flowers and decor pieces. This is a great tip! Remember that wood not only looks beautiful – as we can see in this image – but it is a cost-effective material that will last for many years to come. Have a look at these tips for integrating wooden elements into your home. In this image, we come across the beautiful kitchen, which is connected to the dining room but subtly separated thanks to a large breakfast bar. The kitchen features patterned tiles, which introduce charm and personality to the space. Remember that your kitchen is the heart and soul of the home, so it should be cheerful and warm. Paired with the neutral tiles, wooden ceiling and copper lights, this is the ultimate country kitchen. Tip: Install a kitchen bar with some bar stools, where the family can gather around for a more casual chat! We end off our tour looking at how the home looks out onto simply stunning surrounds. The rolling lawns and abundance of trees and flowers makes for a gorgeous focal point. The terrace allows family and friends to relax and enjoy these views over a cup of tea or a glass of wine. The designers have furnished this space with comfortable chairs and tables, allowing them to really make the most of this area. Have a look at these 10 ideas to improve your small terrace for inspiration for your own home. If you've enjoyed this home, you'll love these 10 Wooden Homes That Will Make You Yell WOW! Would you want to escape to this home?